Are USB chargers available for Angled Power Strips? 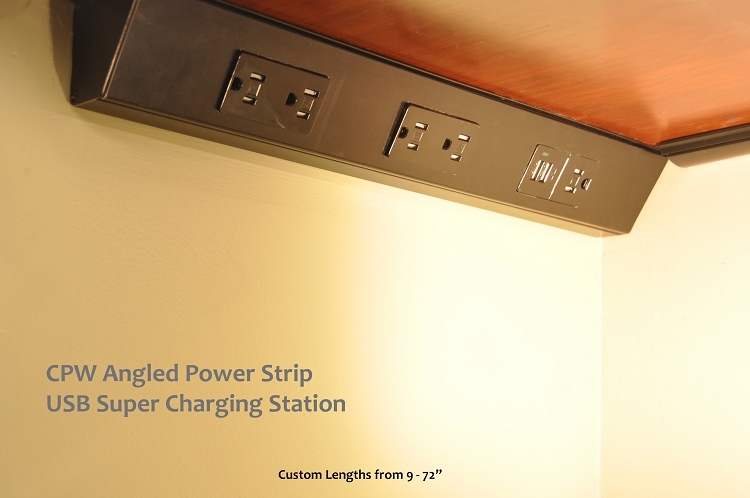 The TR series of angled power strips can be configured with a USB charging port. This is an optional accessory and requires a custom order to be placed. -- Angled Power Strips (TR Series) Pricing depends on the size of the strip selected. It is a built to order strip and in most cases, an additional opening can be added. e.g. an 18" strip comes standard with 2 receptacles. With the custom order, you can have the 2 receptacles and the USB Charger. You select the position where you want the Charger to be installed. A simple configuration has been provided for those who only want a USB added and can select what position they want the USB installed. -- Angled Power Strip (USB Charging Station, TR Series) Further questions can be directed to our customer service.